Man was created by God to rule and reign and govern the kingdom of God – on earth. When Adam sinned, God set in motion a glorious plan that would redeem mankind. ‘The Seed’ of the woman was to crush the head of the old serpent.. called the devil, and down through the centuries the Seed was passed from one generation to another. The Seed travelled through Enoch to Noah – from Noah to Shem and on to Abraham. It continued through Isaac and Jacob, whom God renamed as Israel, prince with God. The sons of Jacob became the 12 tribes of the little nation of Israel – the people of God. They were to be a holy people unto God, for He had chosen them to be a people for His own possession –selected from all the people groups on the face of the earth. Israel was to be a witness to the world that Yahweh was the one true and living God. God made Himself known to Israel and they were to make God known to the world. God chose to reveal Himself more and more to Israel so that they would know Him as the powerful Creator God and trust in Him, as their loving Lord and gentle Saviour. Before Me there was no God formed, and there will be none after Me. I, even I am the Lord; and there is no Saviour beside Me. Isaiah 43:10-11. Israel was to tell of God’s saving grace and turn the gentile nations back to Him – for God desires that ALL people know and love Him as Creator, Saviour and Lord. Israel was to tell the good news of salvation to all the gentile nations of the world. Israel was to be God’s tool – to turn the nations back to Himself and His truth. Israel were God’s chosen people to be His witnesses to the uttermost part of the earth. God made covenant promises with Israel – and one was a conditional promise.. If the nation was faithful to their calling – God would bless them mightily. If the nation was unfaithful to their calling – God would punish them severely. But as a nation, Israel rebelled against their God and did evil in the sight of the Lord. Prophet after prophet was sent to Israel to call the nation to repent of their sins, but they would not repent of their evil deeds and were taken captive into Babylon. Yet silently the Seed of the woman continued to travel through a faithful remnant. The Baptist was to herald the Seed Who came to save His people from their sins. The Baptist was God’s forerunner to Israel’s Messiah – promised so long ago. The Baptist announced, I have seen and I testify that this is God’s Chosen One..” He pointed the people to the Lamb of God Who takes away the sin of the world. The ministry of the Baptist was to prepare Israel for the coming kingdom of God. Paul also reminds us that John’s ministry to Israel was a baptism of repentance, for John called the people to Repent of their sins, turn to God and to believe in the One Who was to come after him – that is, Jesus, for the Kingdom of Heaven was near. The witness of Israel was to be replaced with the witness of the Church – for a time. The gospel of the kingdom was to be replaced with the gospel of grace – for a time. The promised kingdom was to be postponed – until the whole nation of Israel repents. And Acts covers a special, unrepeatable period of time – a unique time of transition. It was a period of history that bridged the old covenant with the new covenant. It was a bridge between Old Testament living and New Testament life. Israel’s gospel of the kingdom had to be postponed during the church dispensation – and the Church proclaiming the gospel of grace became God’s witness to the world. But the day is coming when Israel will once again be God’s witness to the nations. 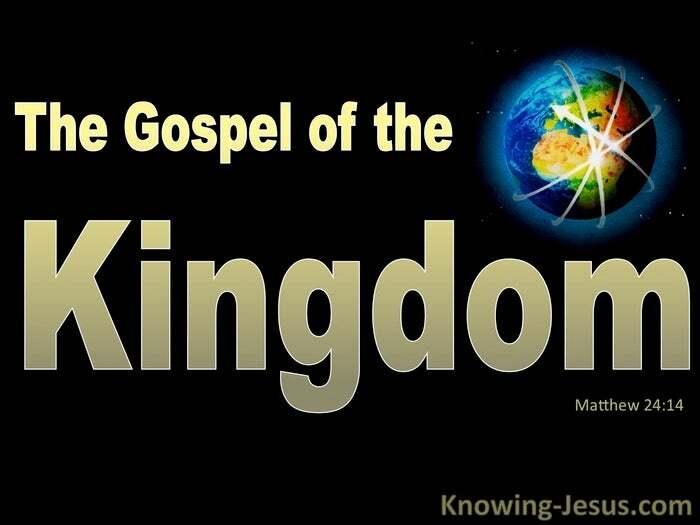 The day is fast approaching when the gospel of the kingdom will again be taught. 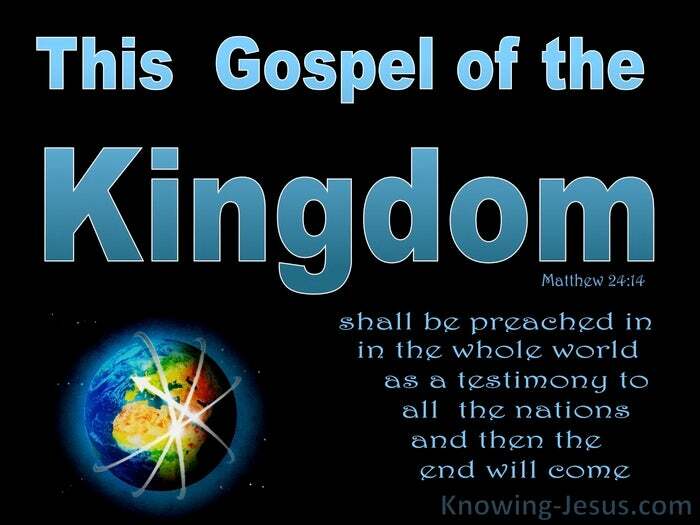 The day is fast approaching when Israel will again be God’s witnesses and proclaim the gospel of the kingdom to the nations – for this gospel of the kingdom will be preached in the whole world as a testimony to all nations, and then the end will come. Today we live in the church age when the gospel of grace is taught to the nations. Today God is continuing to do His work through the body of Christ – the Church.. but a day is coming when the Church will be raptured – and in that day the gospel of the kingdom of God will be taught to all nations…by a faithful remnant of Jews.